As far as it is in my power, I do not eat alone. It’s better if I have notebook and pen in hand, but I still look for someone to have at the table with me. 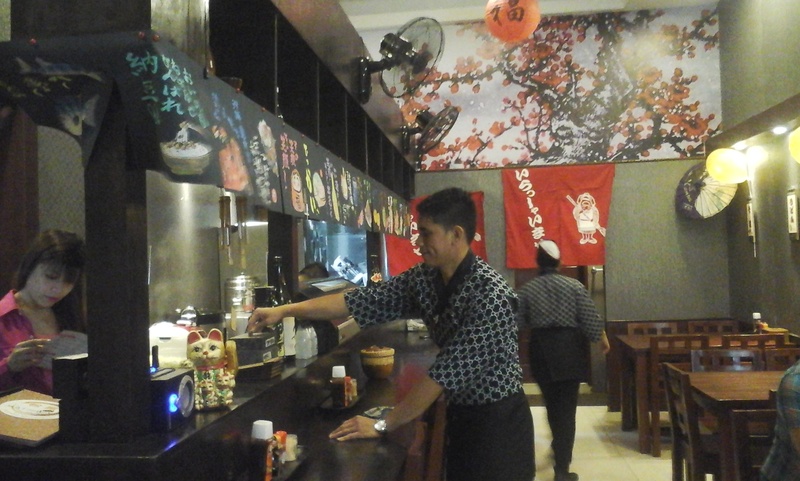 However, tonight, I broke personal tradition, and deliberately and literally U-turned into a small new Japanese diner along 1st Avenue, BGC (around the corner from BGC). I’d seen its posters for a while, and it was finally open. I couldn’t resist. The corn tea of Matsuya BGC. Served hot and free. Delicious! 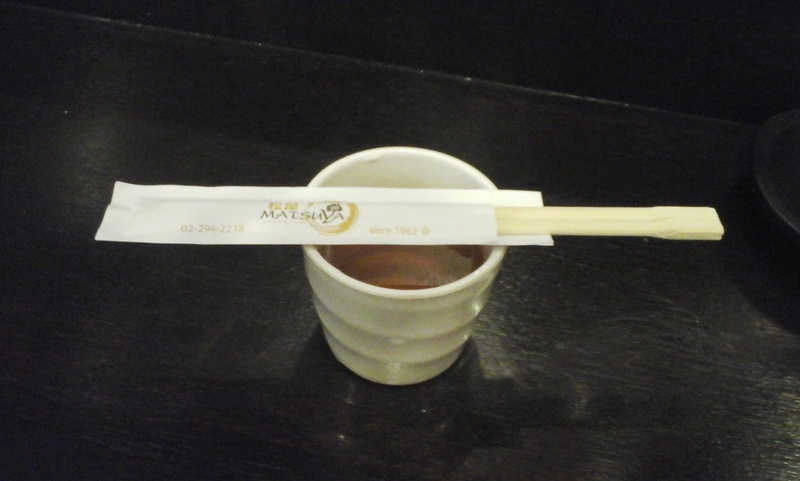 I had just sat down to look at the menu, when they served me hot tea with the chopsticks balanced on the cup. Free tea! I shrieked in my head, then sipped at its refreshing warmth while going through the menu. It was regular corn tea, but not too strong, and it made me hungrier than ever. 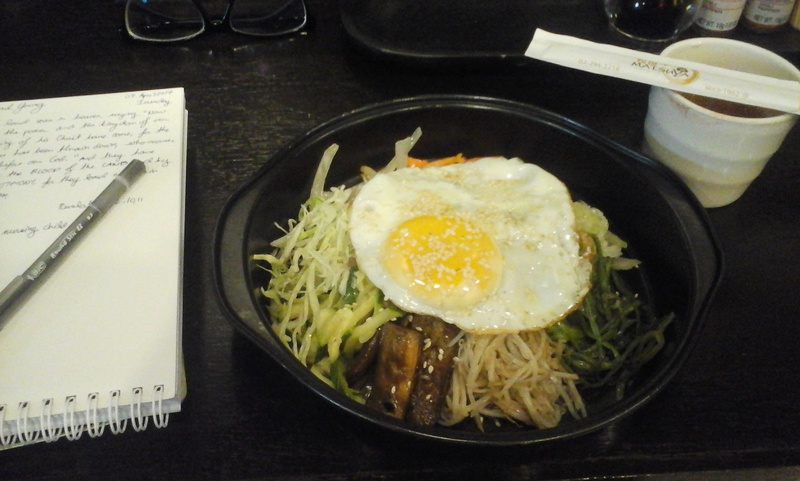 Craving vegetables, I ordered bibimbap, which came within a startling five to seven minutes. The food was not steaming hot, but since it had vegetables in it I appreciated the crunchiness of them. For original bibimbap, without any extra drink, I only paid Php 150. They were generous with the vegetables, and I ate until I was both full and satisfied. Original bibimbap for only Php 150. Satisfying to the core. Because of the amount and weight and the general tastiness of the food, I craved something sweet after the meal. However, there is no dessert section of the menu, and they suggested drinks instead. I declined and had ice cream at the neighboring 7/11, but when I go back to Matsuya BGC I’ll order a drink with the meal and see how that goes. 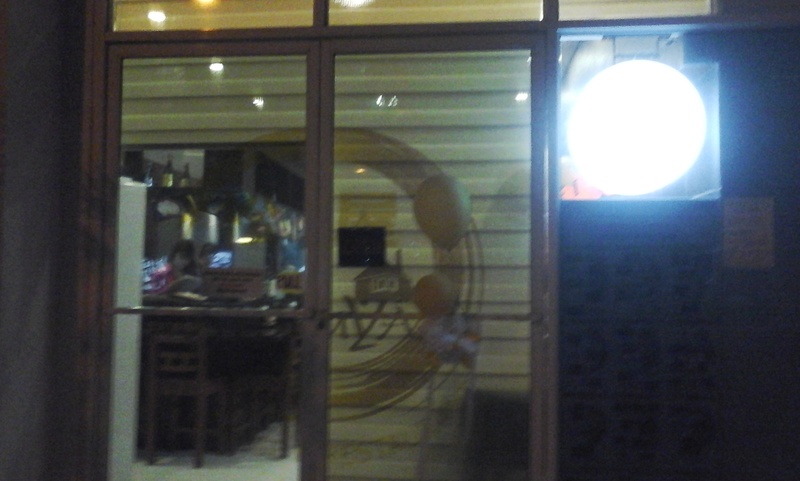 Matsuya BGC is wood and clean yellow lighting. I fell in love with Matsuya the moment I entered it. They don’t go overboard with the style, keeping the overarching decor wood and adding color that blends with the brown. The lighting is mild enough so you don’t feel like you’re under a spotlight, but bright enough so you canwork or study in it in comfort. My greatest love was the long bar and its barstools, of course. It made the best and most efficient use of the space, and added uniqueness to this small Japanese diner. However, it is almost a hidden room. Just remember it’s right beside Pup Culture. If you hit the 7/11, you’ve gone too far. Not so easy to find if you don’t know what you’re looking for. It keeps 10am-2am hours, targeting late-night office workers and the BPO industry, I’m guessing. It looks like a good place for meetings, and might even be a good place to order from if they have that option. I will definitely bring family and friends there. Drop by!